I was going to write a blog a bit ago about the hazards of life at sea. 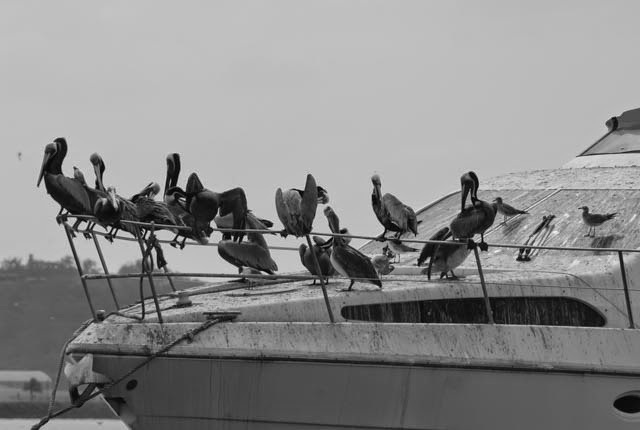 It was going to be about bird poop, barracudas, and shipwrecks. Then I thought that it wouldn't go over too well so I shelved it. Well, it’s back again, mainly because Saturday evening we witnessed a shipwreck with an amazing amount of seafaring pandemonium. It brought back the thought of this topic. 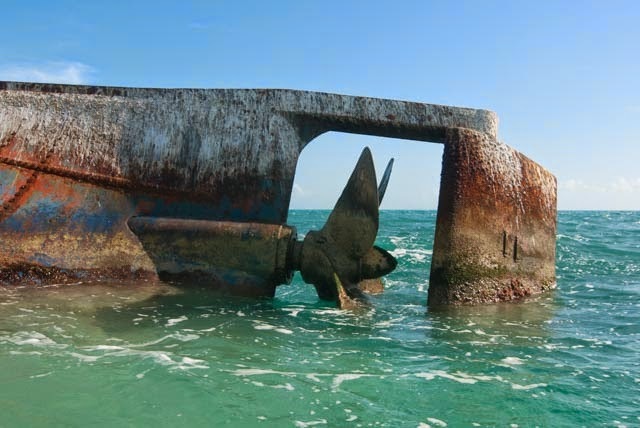 But first, in the Bahamas at Warderick Wells there is a national historical site where legend has it survivors of ships that terminated their travels on the rocks. They engraved the ship name and the date in tribute to life continued, a gratefulness to surviving tragedy at sea. 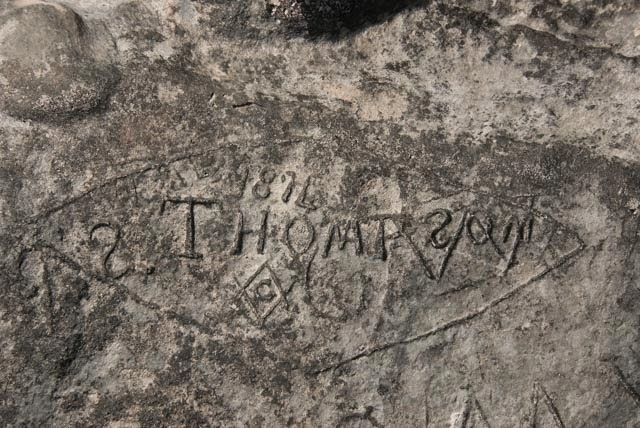 They dated back into the 1700’s but were hard to read. 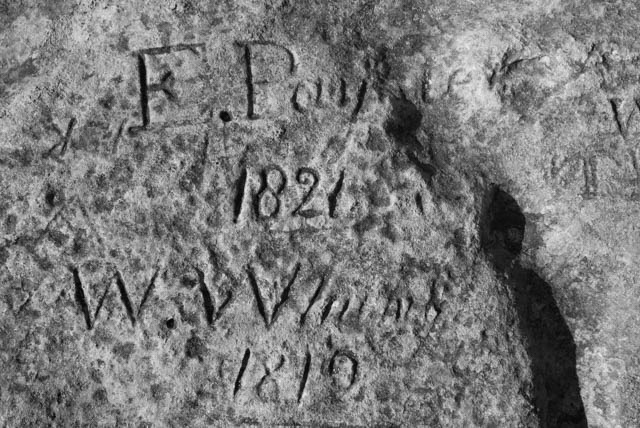 Shipwrecks have been here since ships. 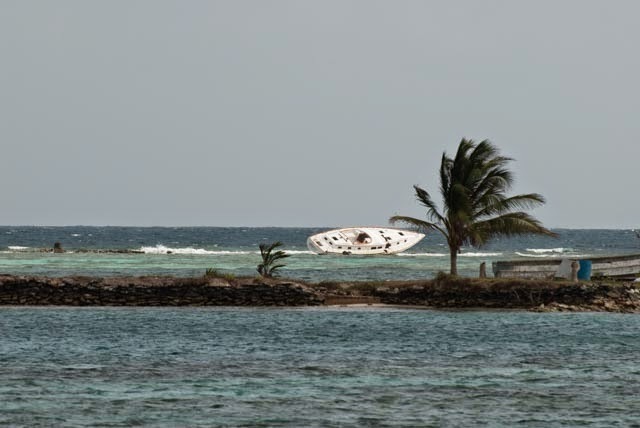 In the San Blas Islands there were a plethora of modern boats that littered the reefs. Some were as recent as the week before. The Captains turned a little too early or a little too late. So I determined that shipwrecks will continue as long as there are ships. 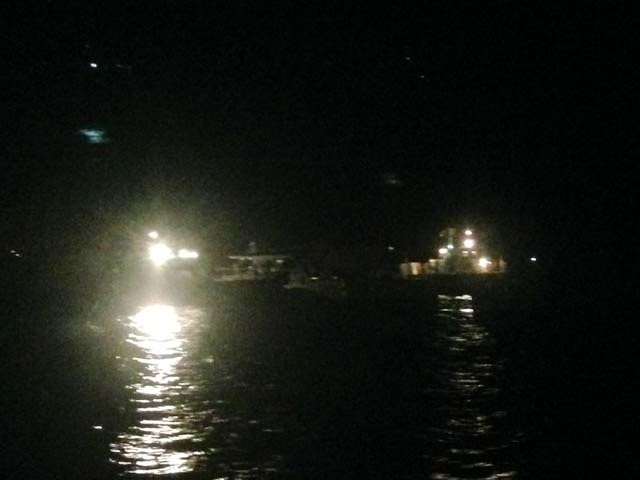 On Saturday night, a large charter catamaran was returning to the dock here after dark. It was loaded down with about 25 fun seeking passengers on board. At the same time, on the way out from the dock was a crew boat, a large powerful tug like boat that runs out with crew and supplies to the ships at anchor in the bay of Panama. One coming in and one going out. 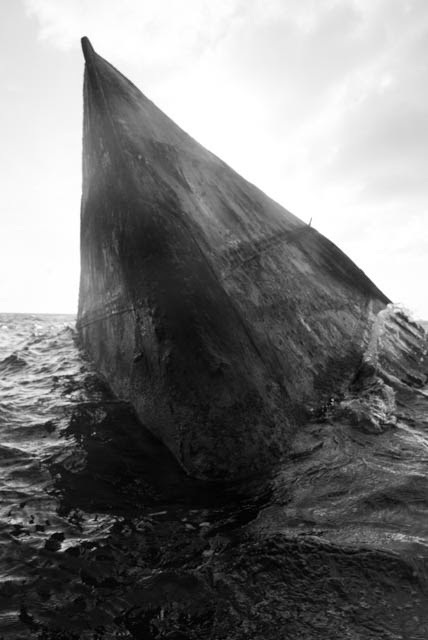 We heard the crash but didn’t directly witness the impact, but when we stuck our heads out, the two boats were firmly impaled, the tug well into the space between the catamaran hulls. It was bad. The radio ignited with activity. There was a problem with the communication however in that there was no common radio channel, nor a common language. There was also no common logic. It was the pitch black kind of dark out, and as we all tried to get our senses focused we realized the crew boat was throttling up and pushing the catamaran backwards at high speed. The passengers were screaming. At first, I thought he was trying to drive the catamaran up on the beach before it sank, but then the captain threw the crew boat's big engines in reverse to apparently try to yank himself out from the catamaran. Not a particularly good plan. As he continued to perform this maneuver the mess drifted into a ferry boat. By now the passengers were screaming with a deeper level of emotion. 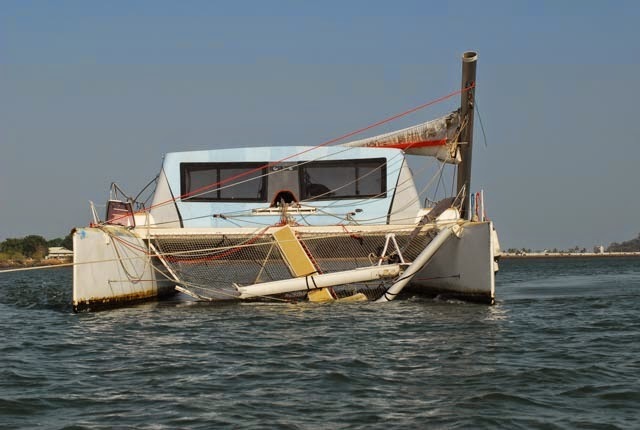 An English speaking canal pilot was nearby and managed to get himself by ponga onto the catamaran where he found its captain frozen in panic. We all were trying to get a handle on how to best assist but found no reliable way to communicate. The canal authority doesn't use radios so we were relaying needs and messages inter-boat and inter-language by radio and telephone. The police authority doesn't use VHF radios like all mariners do; they use some other system so nobody can talk to them. 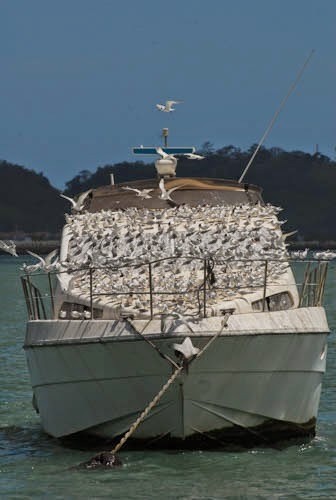 Other crew boats arrived and started pushing the mess this way and that, and without interruption in the engines revving, and the thrashing, two little ponga’s (launches) were trying to unload passengers and get them to the safety of the dock. 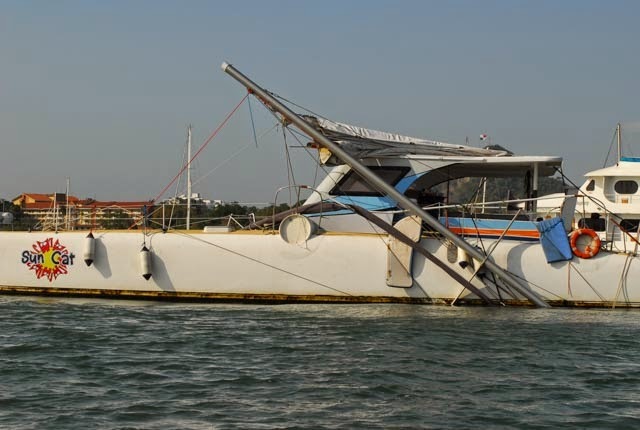 As a ponga loaded with people was alongside the catamaran, the initial crew boat finally managed to yank himself out from its impaled position in the catamaran, but not without taking down the mast on the catamaran. I watched the snap of the spar and heard the stainless steel rigging holding it up twang, like all the strings of a guitar breaking at the same time. The mast fell across the top of the loaded ponga. The pilot now on board simply said “we have a problem” as pandemonium escalated. Nobody could find a way to call and have an ambulance standing by. We all feared certain injury. Fortunately, the ponga was close enough alongside that the base of the mast cleared the people with only a few cable impacts. 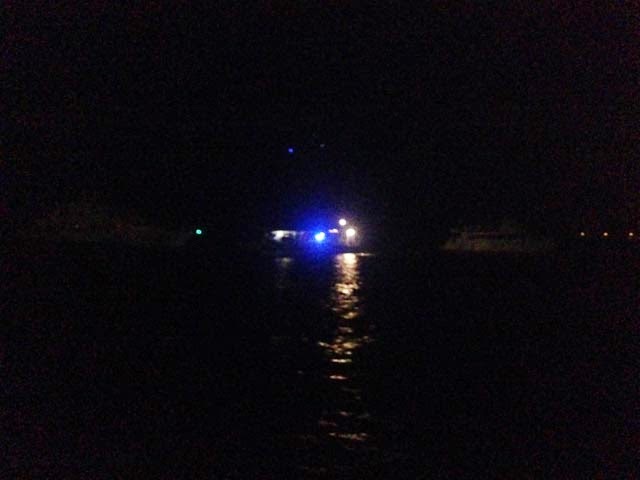 The police boat arrived but would not assist as they were completing a report as to activity thus far. By miracle alone, and despite the participants attempts otherwise, nobody was hurt. 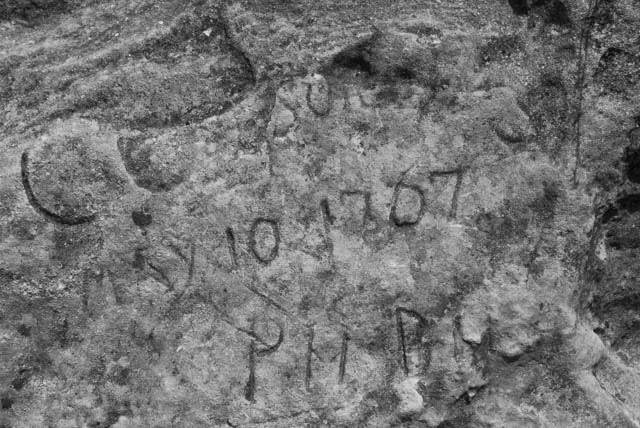 I decided to revise my initial blog as bird poop and barracudas simply don’t compare to shipwrecks. Also, I learned if one must shipwreck, it might be wise to do it somewhere else where you at least have a chance of reasonable survival. Actually I like Panama, I think maybe it just outgrew itself so quickly it missed a few key parts. I am getting impatient to continue our journey. We are now in the throes of the final provisioning and preparations to depart Panama for the Pacific. 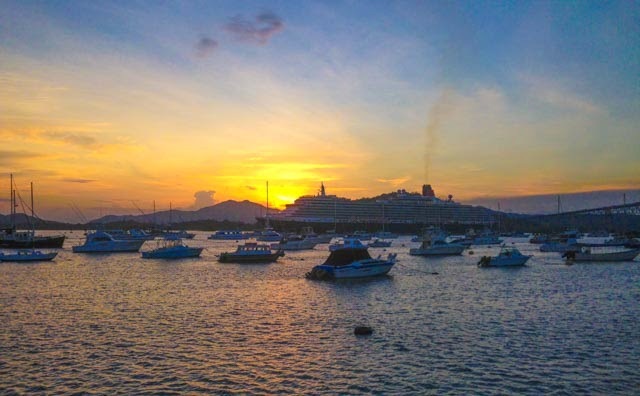 We are hoping to leave here on Wednesday, spend a few days in the Las Perlas Islands, and then do the week crossing to the Galapagos where we pick up more crew. Please keep us in your prayers. Sea Angel is sailing for a cause. * As previously reported, Sea Mercy is working to raise funds to assist with the sheer devastation from Cyclone Pam this past week in Vanuatu. From this past week we have come to understand the importance of infrastructure and communication, most notably in emergency situations, and this is part of the journey and call for Sea Mercy during this time of learning and assisting alongside major aid relief organizations worldwide. You can learn more here, and please consider a donation or even a medical rotation if you're able. The people of Vanuatu can use help and prayers at this time. Sea Mercy is a benevolent program developed for disaster and critical care needs for remote islanders. Sea Mercy is a non-profit 501 (c) (3) charity with a simple vision and mission to "stand in the gap" with a service delivery vessel, trained health care volunteers, support equipment, and critical care services as island nations develop their "outer island" health care infrastructure, when critical health care need opportunities are present, or when disasters occur. We welcome you to consider donating on our behalf to Sea Mercy - they have several ways to get involved and are so grateful for your support. Sea Mercy's Corporate "We Care" Program is designed to help organizations attract and engage clients, vendors, and employees in the spirit of social responsibility and provide a wonderfully enriching partnership. There are several ways to participate with "We Care". Visit Sea Mercy's website for additional information. If you know of an organization or would like to involve yours, please share this information forward. SPECIAL NOTE - Right now there is a category five cyclone directly hitting the South Pacific Island Nation of Vanuata and many fear the worst. 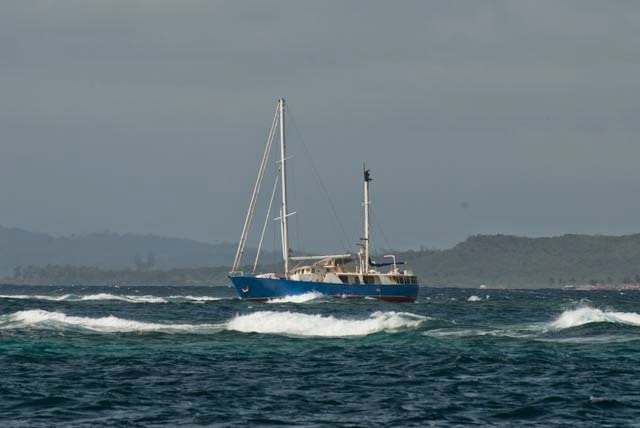 Although Sea Mercy has not officially partnered with Vanuata yet in 2015, they are on stand-by to help when the storm has passed. The need for aid is speculated to be great. Please help us by helping Sea Mercy and keeping up with what is happening in Vanuata. Read how to get involved at the bottom of this blog, and God Bless! First- I apologize for being absent for a while! Somehow, just after clearing through the locks and just prior to a planned family visit to Seattle, I caught a pretty bad virus. It was a bit rough and put me back in schedule some. I recovered fully in Seattle and with a reschedule of my return flight I am now back on Sea Angel and getting us ready for crossing the Pacific. Panama is an amazing place. 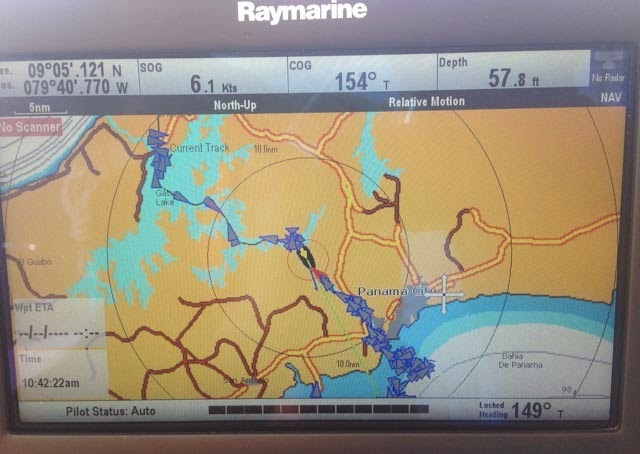 For us boating types it is a world crossroads. The seas on either side are dramatically different. The Caribbean side was lush, the sea there clear and with limited tidal variation, for the most part peaceful and calm. On the Pacific side there is more contamination due to prevailing winds coming offshore bringing commercial, mostly ship pollution and soot as well as ashes from fires in the interior. The water is not as clean here in the harbor so we choose not to swim or run our water maker, but the sea life is absolutely astounding. Watching the birds feed at the tidal change (about 12’ from low to high), is watching a veritable feast. It is absolutely crazy to watch them feed. Included are a couple pictures of them resting, probably digesting? in the center in Sea Angel! The Panama Canal transit was a real highlight. For me there was a lot of anticipation and maybe a bit of anxiety as I had never transited through locks this large, and with such big companions. There are three locks back to back going upward to Gatun Lake, a long inland transit, and then three locks back down on the Pacific Side. It took us two days. 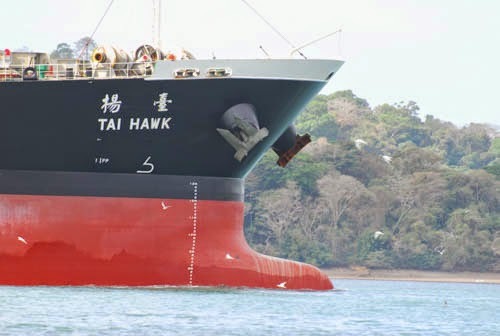 We all learned quickly that the transit is about speed and efficiency as it is very busy and time is a lot of money when they are dealing with getting huge commercial ships through. It took us one raft up and one lock to get the hang of it, but from then on it was really smooth. Sea Angel was scheduled through the Canal with two other sailboats, both smaller, so we were the center boat and drove our “raft” through the locks. There was substantial turmoil in the water and a lot of stress on our small boats and lines as the locks filled, and then again when we got some prop wash from the big ship just in front of us. There was a bit of yelling between the advisors (one on each boat) and shore side line handlers. 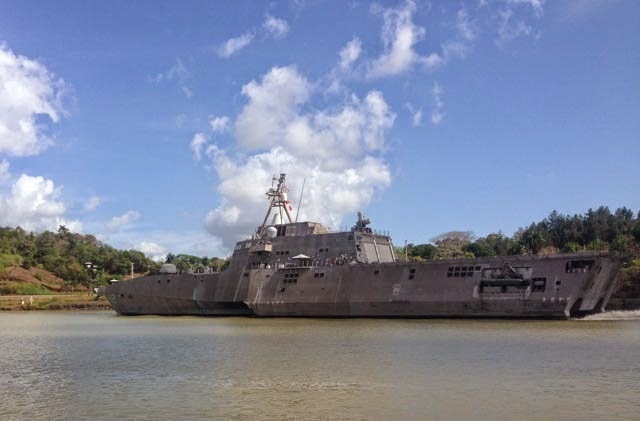 We made it through three locks up on Saturday afternoon/evening then spent the night tied to a mooring in Gatun Lake. That evening we heard the nearby howl of the black monkeys in the jungle. The next morning we arose early and transited Gatun Lake and the narrow cut on the way to Milflores locks where we dropped back down to sea level on the Pacific side. It was a great opportunity to experience and receive the benefit of such a large work of human engineering. We also got to see all the work being done on the new larger locks under construction. We are now on a mooring in a district of Panama City called Balboa. We are just a few hundred feet from the shipping lanes and get to watch the endless stream of large vessels in the crossroads. 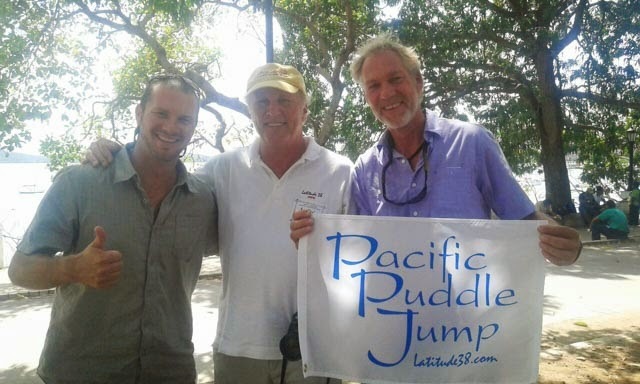 We have attended a Latitude 38 “Pacific Puddle Jump” kickoff party and have a wonderful new friend that has helped us connect with the needed resources to put all in order aboard Sea Angel. All is well. Panama is and has been for us a place of transition. There has been much that is changing in our environment, the scope of the journey to come has changed, there is a difference in our emotions, and in the detail of our preparations. Panama has deservedly earned the title of “crossroads of the world” in my mind. Please keep us in your prayers as we continue to prepare and then depart for the Galapagos and on to the Southern Pacific. 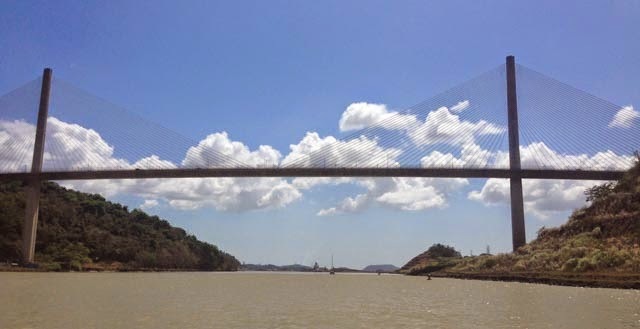 PS - Watch below for a time lapse of our trip through the Panama Canal! The Sea Angel is sailing for a cause. Sea Mercy is a benevolent program developed for disaster and critical care needs for remote islanders. Sea Mercy is a non-profit 501 (c) (3) charity with a simple vision and mission to "stand in the gap" with a service delivery vessel, trained health care volunteers, support equipment, and critical care services as island nations develop their "outer island" health care infrastructure, when critical health care need opportunities are present, or when disasters occur. Right now there is a category five cyclone directly hitting the South Pacific Island Nation of Vanuata and many fear the worst. Although Sea Mercy has not officially partnered with Vanuata yet in 2015, they are on stand-by to help when the storm has passed. The need is speculated to be great. Please help us by helping Sea Mercy and keeping up with what is happening in Vanuata. We welcome you to consider donating on our behalf to Sea Mercy - they have several ways to get involved and are so grateful for your support.